Available now in the Dragon Age Keep, The Last Court is a very Failbettery game of lordship where you play as the ruler of Serault, an eclectic fiefdom at the farthest end of Orlais. As the Huntress or Scholar, you’ll guide the realm through its most crucial period in its history. Will its ancient Shame be forgotten? Will Serault fall into obscurity? Manage the affairs of your court. Choose a lover, a counselor, a bodyguard, and an accomplice. With stories to explore and secrets to unravel, you’ll meet a host of new characters and encounter a few familiar faces in The Last Court. Our partners at Failbetter are known for their craftsmanship and unique gameplay, and we’re confident that fans of BioWare and Dragon Age will appreciate what they’ve accomplished. The Last Court is free to play and designed so that all players can experience it without hitting a paywall. If you want to speed up time in the game or gain additional actions, you can purchase Dawn, the in-game currency. However, purchasing Dawn is not required to complete the game or see all of the content. If you want to see everything, you might need multiple playthroughs. Each one takes an average of 7 days to complete. 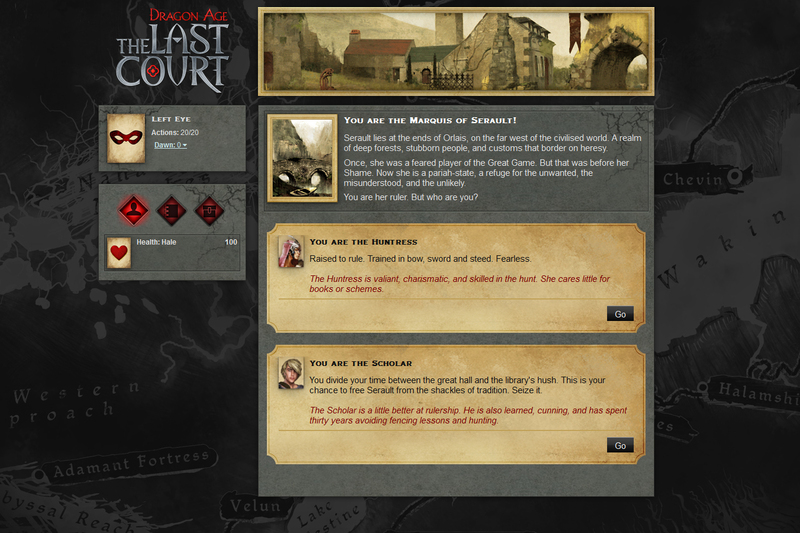 The Last Court works best on a desktop computer with a modern browser and is accessible only through logging into the Dragon Age Keep.